When we think of solar power we often envisage solar panels on rooftops to generate heat or electricity. But as the technology evolves and we become increasingly mobile, solar power innovators have risen to the challenge and created some exciting solar powered units that can generate energy on the go and in remote locations. 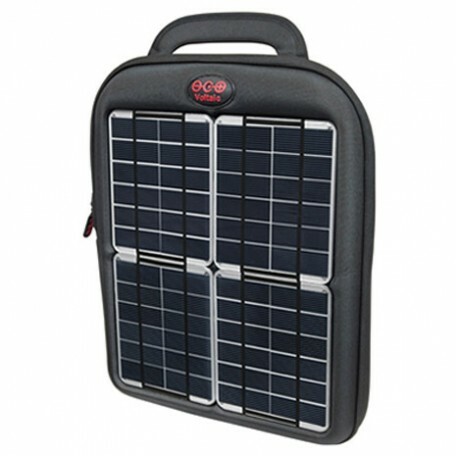 There are many advantages to portable, mobile solar power generation. Besides the freedom that it can allow us, having a small, portable solar power generator or battery can come in handy during emergencies. 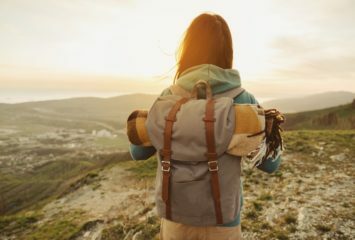 Solar lends itself particularly well to portability as solar cells can be added to different types of gear, while generators can be taken anywhere without grid connection. The technology keeps getting better and the marketplace offers a wide range of products for those who want to declare independence from fossil fuels such as those outlined below. 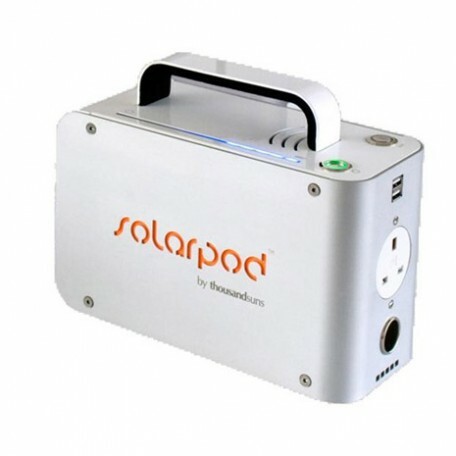 Solar Everywhere: Thousand Suns’ Solarpod (www.thousandsuns.com/) portable generator is one of the most exciting solar products that have recently entered the market. The company is a UK based start-up founded by Jean Viry-Babel and Patrick Kemmis, who created a patent with the Imperial College in London for the Solar Concentrator, a product which would magnify the power of the sun in order to boost standard solar panels. It was created in Singapore and expanded to other countries but didn’t gain traction in the UK. Despite the initial failure, the duo persisted with the project and teamed up with Robert Smithson, who had an idea for a portable solar energy generator that could replace noisy and polluting diesel generators. The Solarpod was born. It features a high performance lithium Iron Phosphate battery, which is safe and environmentally friendly. It is fitted with a 400W inverter, a UK 3-pin socket, 2 USB ports and a 12V car socket. It can be charged either with solar panels or by plugging it directly into the mains. Thousand Suns says their product can run a 32in LCD TV for five hours and provide 40 charges to a smart phone. The company is currently expanding to several countries and says market reception has been overwhelming since Solarpod was launched earlier this year. Solar Camping: As basic as they may sound, solar flashlights are a must-have gadget for anyone who likes camping, trekking and venturing into the wilderness to be in contact with nature. A quick online search will yield a huge number of results and they cost as little as $9 for basic models. The flashlight problem out of the way, we need to think about food. And this is where the Sun Oven (http://www.sunoven.com) comes in. Yes, it’s an oven powered by the sun, so no more lighting fires in the forest. It can reach temperatures of 360 to 400◦ F and is fairly light at just 21lbs. It comes with a carrying handle and its manufacturers say it opens and folds up in seconds. 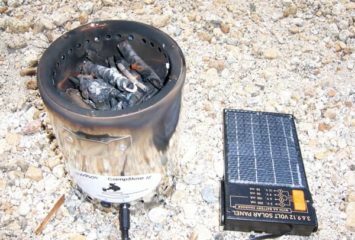 The Sun Oven is not just for green campers, it can be used by anyone who does not want to rely on electricity or gas when cooking and it’s an ideal solution for emergency-stricken zones. Techno-Solar: Voltaic Systems (http://www.voltaicsystems.com) is one cool New York-based solar power company that makes products that can generate and store their own power to run electronic devices. 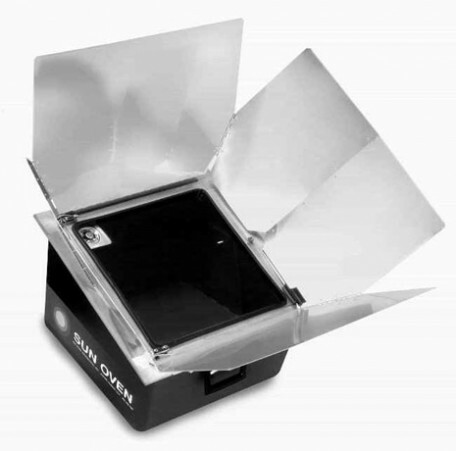 Its visual presentation is clearly marked for Mac-heads and indeed the star of its catalogue is an iPad solar charger, although it can also be used with other tablets. Besides the charger, Voltaic Systems sells compact and larger solar bags, high power chargers, small solar panels and external batteries and adapters. Fast Company has called it ‘backpack on steroids’. And a great deal of voltage, too. Solar Clothing: OK, as far as solar clothing goes, we’re still more in Barbarella territory than everyday life, but the ideas out there can be quite fabulous. Take, for example, the bikini that is covered with solar cells. Created by New York designer Andrew Schneider, the Solar Bikini can generate enough electricity to power portable devices such as media players and mobile phones. Schneider is producing a limited edition of his creation. Considering the media attention he has attracted, it’s bound to charge into the fashion world with a clear sustainability message. 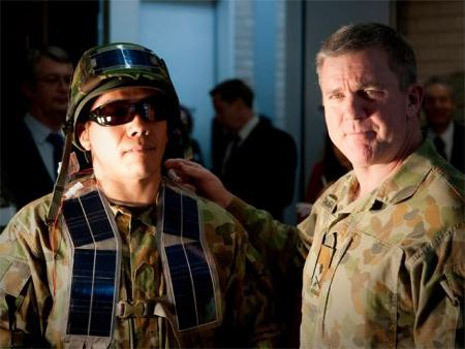 Meanwhile in Australia, the army has embraced solar with a little help from the Australian National University, who created a wearable solar panel. Soldiers these days need all sorts of electronic paraphernalia, from GPS to night vision systems, and charging them is a challenge. The panels are much lighter – and greener of course – than batteries (they are as thin as paper) and can absorb light from both sides. Transform Solar, the Idaho outfit who will be producing the solar panels for the Australian army, says a prototype will be ready by December. 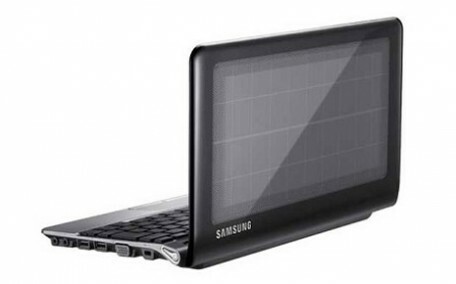 Solar Portable Computing: Probably one of the most anticipated solar gadgets of 2011, Samsung’s NC215S solar netbook is already selling – and fast. The solar panels are installed on the laptop’s lid and Samsung promises a battery life of 14.5 hours, which is quite outstanding. The other configurations are standard: 10.1in, 1024 x 600-pixel display and weighs 2.86 lbs. It features an Intel Atom N570 (1.66 GHz) dual-core processor, 1GB of Ram and a 250GB or 320GB drive. It costs US$404.79 on Amazon.